Delicious white chocolate brownies with a wonderful fudgy texture and perfect flavor. Easy to make with just a few ingredients! When I first started thinking about making a recipe for white chocolate brownies, I was hesitant because I wasn’t the world’s biggest white chocolate fan. However, a bite of real white chocolate made me realize that the weird, fake white chocolate I’d tasted in the past had given me an erroneous impression of white chocolate in general. 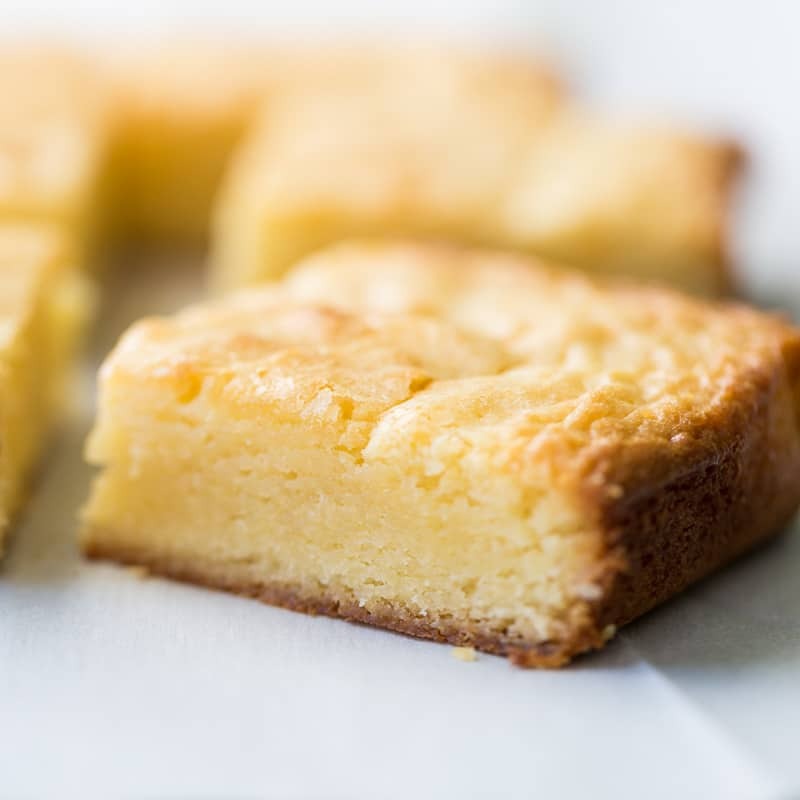 So I bit the bullet and began researching recipes, because I really wanted to make absolutely perfect white chocolate brownies that would exhibit just how wonderful white chocolate could be. I decided that I would save this recipe to prepare as a treat for one of those rare moments that I get to have the house all to myself. Finally the day came to make the final, perfect version of the recipe. I had my recipe ready to go. I had my ingredients all lined up on the counter. I had the house all to myself. Suddenly, an unmistakable tension started in my shoulders and proceeded to wind right up the back of my neck. There I was, ready to spoil myself with a pan of white chocolate brownies and a blissful round of television, when the telltale signs of an oncoming headache crept inexorably into my awareness. Darn it! How was I supposed to make my special white chocolate brownies while in the throes of a headache? Never fear, dear reader. 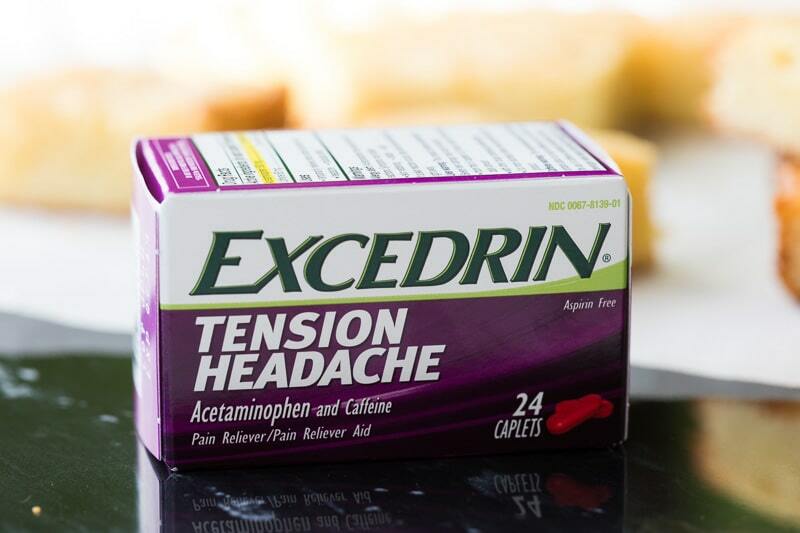 Luckily, I had some Excedrin® Extra Strength on hand for fast headache relief. I keep Excedrin® Extra Strength (for everyday headaches) in our medicine cabinet, along with Excedrin® Tension Headache, for those times when I don’t want a headache to ruin the moment. Excedrin® Tension Headache provides aspirin-free pain relief, while Excedrin® Extra Strength can deliver relief in just 15 minutes. 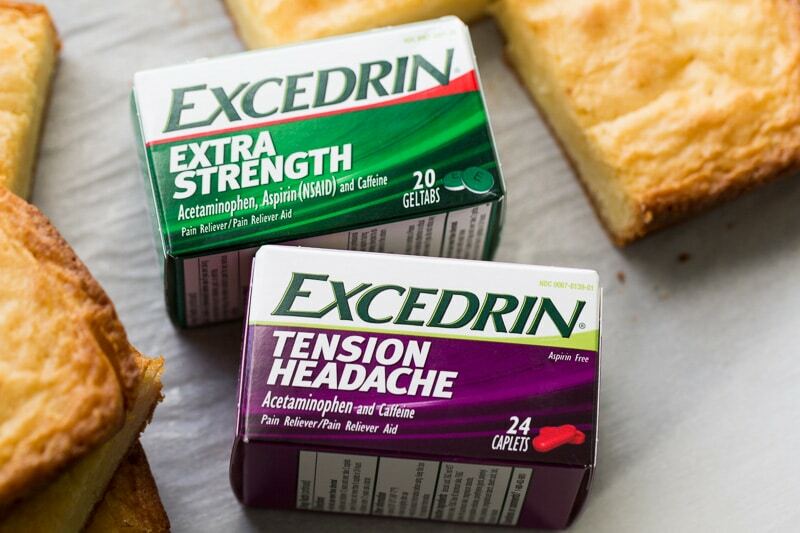 Excedrin® products provide a solution for multiple headache types (be sure to use as directed). 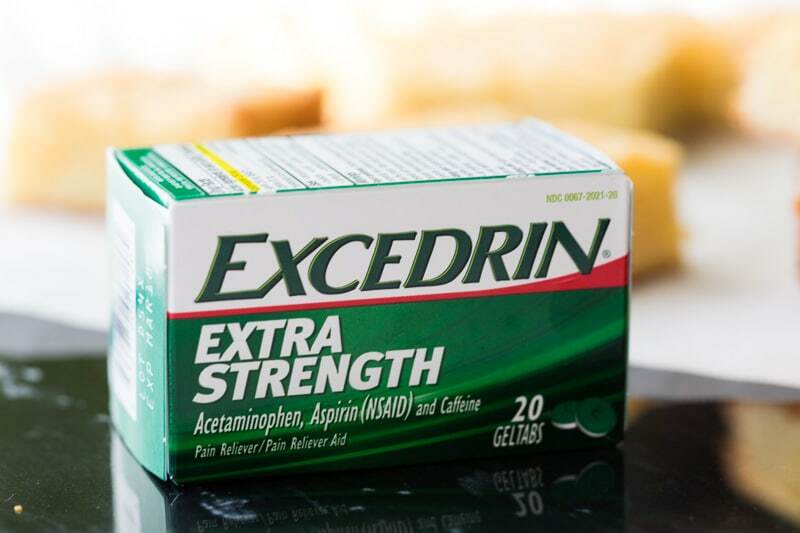 Since Excedrin® Extra Strength works quickly, I read the package directions and took a dose to wipe out my headache quickly. The brownies were calling! Sure enough, within just a few minutes, I was feeling a lot better. I happily cracked open my packages of white chocolate and began preparing the brownies. By the time they had finished baking, I was free of pain and ready to enjoy my time off. Want to make sure that all your memorable moments are headache free? You can pick these products up in the pain relief aisle at Walmart. 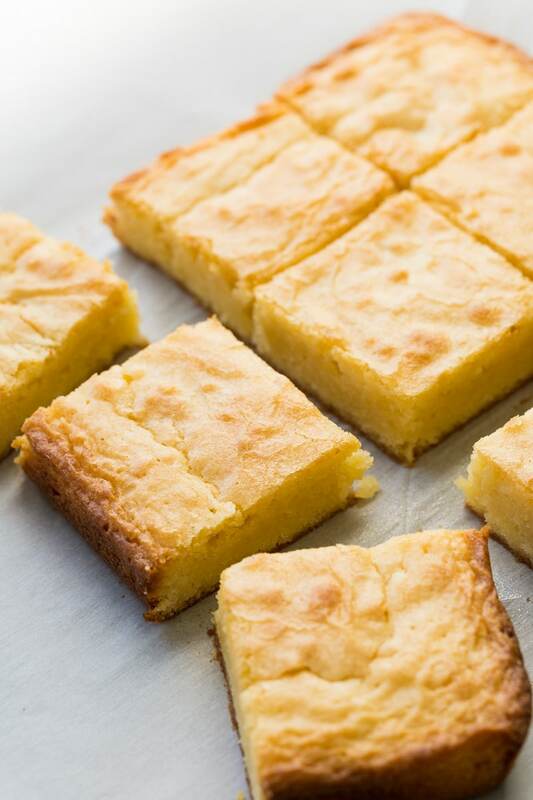 Once you make these white chocolate brownies, you’ll be amazed at both the texture and the flavor. They are supremely chewy around the edges, yet perfectly fudgy and moist on the inside. The flavor is extraordinary, like the best pound cake you’ve ever had, if it were somehow magically transformed into a brownie. This is one of my favorite recipes I’ve created so far. I hope you enjoy a white chocolate brownie moment soon, just like I did! Make sure you buy real white chocolate! Real white chocolate is made with sugar, cocoa butter, dry milk and milk fat, and real vanilla. If you see oil or fake vanilla (vanillin) in the ingredients list instead of cocoa butter, run. To tell when brownies are done, insert a toothpick in the middle. If it comes out goopy, they’re not done. If it comes out with moist crumbs attached, they’re done. If it comes out absolutely clean, they’re overdone. Aim for moist crumbs. Start checking these at 25 minutes. 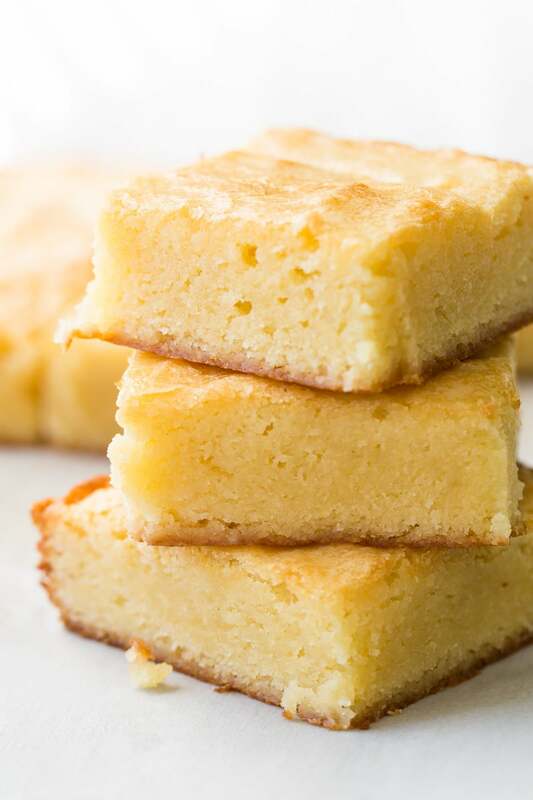 These easy and delicious white chocolate brownies will amaze you! You'll love the perfectly chewy edges and fudgy middle! Preheat the oven to 350 F. For easy cleanup, line your 8 inch square pan with parchment paper or foil. Put the sugar and salt in a large mixing bowl and set aside. Chop the chocolate into small pieces and cut up the butter. Place both in a microwaveable bowl. Microwave at 50% power for one minute, or until the butter has melted (it may take 2 to 3 minutes total, but check after each minute). Once the butter has melted, remove the bowl from the microwave and stir gently until the white chocolate has melted completely and the mixture is smooth. Add the butter and chocolate mixture to the large mixing bowl with the sugar and salt. Stir until combined. Add the eggs and the optional Grand Marnier and stir until combined. Sprinkle the flour over the batter and stir together until just combined. Pour the batter into the prepared pan. Bake at 350 for 25 to 30 minutes or until a toothpick inserted in the middle comes out with moist crumbs but no wet batter on it. Grand Marnier is optional, but even the tiny bit of it adds a very subtle sophistication to the flavor. You can also substitute the same amount of rum. Trust Excedrin® for fast headache relief. Follow Excedrin® on Facebook, Twitter, and Instagram. These might convince me to like white chocolate! I would never have thought to make brownies with white chocolate! Brilliant. Now I want some! They’re one of my favorite recipes that I’ve made so far for this blog! I love white chocolate brownies! Next time I’ll add some Grand Marnier to my recipe…great idea! Thank you! I saw a recipe in an old Williams-Sonoma cookbook for white chocolate cream with bourbon in it, so that got me thinking about liquor and white chocolate. I’ve never made an all-white chocolate brownie before because I seem to have issues with the white chocolate seizing up rather than melting. But I am going to give yours a try, Katie. They sound and look wonderful. I was afraid of that, too, but the method of microwaving at 50% with the butter worked beautifully. I love white chocolate brownies, which is good because I’m allergic to chocolate. So I don’t even mind the ones made with the not so nice vegetable oil white chocolate. I mentioned the vegetable oil thing because even Ghirardelli, which makes a real white chocolate baking bar, makes their white chips with vegetable oil. From the packaging, you’d never know it was different stuff because they use the same colors and similar wording. I am SUCH a sucker for white chocolate brownies–I used to make them all the time and now I’m inspired to get started again so I can stuff some chocolate in my face–for the first time in forever, you know. Cheers to that! Lovely to meet you as well! This was my first time with white chocolate brownies and I was so surprised at how much I liked them. …oh my god these look amazing! I do like white chocolate, I’ve GOT to try this recipe! These sound wonderful, I am a fan of white chocolate so I know I would love them already!! I. LOVE. THESE. They sound like a dream! Incredible is right….these look amazing! 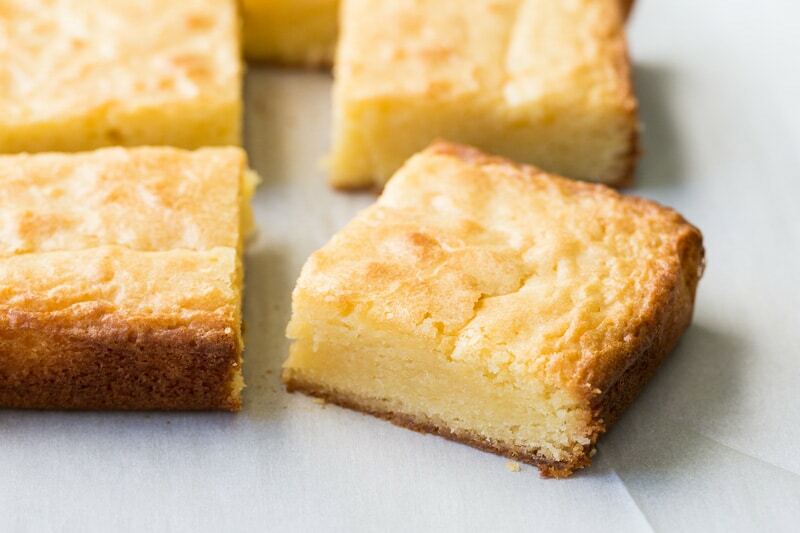 I’ve been dying to make white chocolate brownies, they just look and sound so awesome. I’ll have to try your recipe soon! Oh wow, these DO sound incredible! I have never heard of white chocolate brownies before. I must try them!!!! I’m so glad the Excederin helped your headache. Life is so much better pain free! Mm, these look so delicious. For some reason, I never thought of ever making brownies with white chocolate, but these look heavenly. I’m so going to try this! My daughter doesn’t really like white chocolate. But I really do like it. It does sound amazing. I will have to try this out. I didn’t know you could make a brownie with white chocolate. Great Post! Will definitely try to make this for me next cheat day. Oh my gosh, these look so delicious! I can’t wait to try this recipe. I didn’t realize there was fake white chocolate. Thanks for the heads up, thee look delicious. I didn’t not knew this and I usually have a look at the ingredients on everything to make sure I buy things as healthy as possible (when I say healthy is like not modified stuff). I bet these brownies would be awesome drizzled in sugared strawberries and topped with whipped cream – like a more decadent version of strawberry shortcake. Definitely only for a rare treat, but still yum to think about. Oooh girl! You had me at white chocolate (then at BROWNIES)! These look ah-mazing! I’m always looking for new brownie recipes to try, definitely gotta bookmark it! I would never have thought to make brownies with white chocolate! I can’t wait to try it! Brilliant. Those brownies look and sound absolutely scrumptious. I woke up with a tension headache and wish I had some Excedrin for it. I need to make a run to get some. Mmmmmm, these incredible white chocolate brownies look amazing. This is so cool! I’ve never seen white chocolate brownies before. 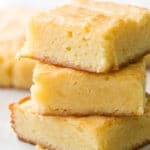 I’ve never heard about white chocolate brownies and honestly it never came to me you can make brownies with white chocolate! I already love it! Wow, white chocolate brownies! Never had one of those before 🙂 . 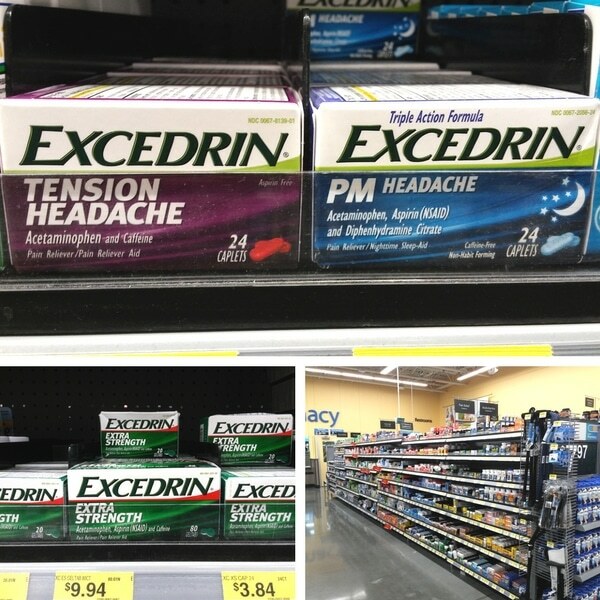 Excedrin is a great for headaches too.